Are you looking for the perfect hotel in Olsztyn? The HP Park Hotel invites you to discover the rich offer of accommodation for private and business travelers. We are a recognized and valued brand on the map of Warmia and Mazury. 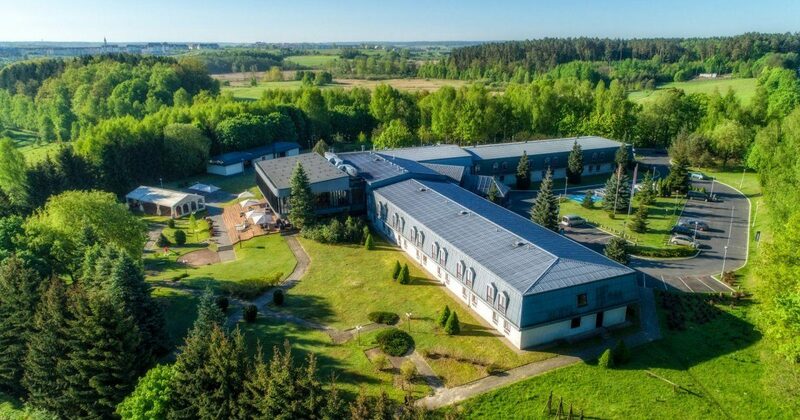 Nice, clean hotel located on the outskirts of Olsztyn. Good comfortable and clean rooms. We stayed in very hot night. Air conditioning was very good. Restaurant had terrace and children playground. Experienced and friendly staff, always at your disposal. A spacious parking lot for buses and cars. Well sunlit, spacious terrace with sun loungers and garden furniture. A wealth of regional dishes, seasonal snacks and fancy confectionery. Experienced chef and a staff team valued for high culinary skills. We are an experienced organizer of trainings, conferences and company shows, valued for high professionalism and comprehensive services. The hotel is in a beautiful area in the nature and we really enjoy our delicious breakfast in the terrasse.The room and the bed were as we expected. The restaurant's menu is dominated by regional dishes with delicious, seasonal additions. The pride of the hotel is the high cooking skills of the Chef and our Team. We know how to create a unique atmosphere of a wedding reception. We offer a spacious restaurant which can accommodate up to 150 people. The best recommendation that our hotel is the right choice are the enthusiastic opinions of Couples, which we had the pleasure to host. In the land of lakes and forests. We would like to thank the entire hotel team for organizing such a wonderful party. Thank you also for serving waiter for their courtesy and professional service. Park Hotel in Olsztyn is a great choice for wedding parties and reunions, we highly recommend! Organize everything 100%! We are grateful for the fantastic organization so important to us and our children of the day. Special thanks to Mrs Klaudia and her staff for maintaining positive energy and atmosphere.In conclusion - a very high level hotel, with a bad atmosphere and atmosphere, thanks to which all the guests were satisfied. We invite you to explore the beauty of the Olsztyn Lake District - the land of forests, lakes and primeval nature. Meditative relaxation surrounded by greenery or the benefits of active rest? The choice is yours! The green surroundings of the hotel have been arranged for relaxation. The spacious garden invites you to walk and regain your strength. The sunny terrace is the perfect place for a shared breakfast or a romantic dinner for two.